Today the ALA Youth Media Awards will be announced live from Seattle. One of the awards that will be announced is the Pura Belpré Award which recognizes a Latino or Latina author or illustrator "whose work best portrays, affirms, and celebrates the Latino cultural experience in an outstanding work of literature for children and youth." 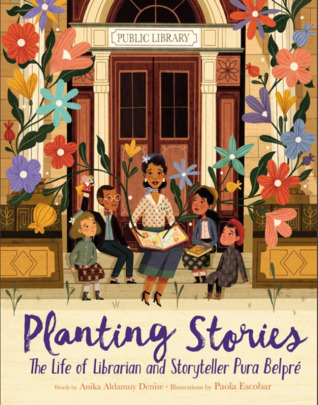 It is only fitting that today we highlight Planting Stories, a picture book biography of Pura Belpré, talented writer, storyteller and children's librarian at the New York Public Library. The story begins in 1921 as Belpré leaves Puerto Rico to begin life in New York. Belpré loves books and stories, and she soon is hired as a bilingual library assistant. When Belpré realizes there are no folktales from Puerto Rico in the library, she tells the children stories her abuela told her as a child. The book describes Belpré's wonderful story hours and her success as a published author of books for children. Whimsical digital illustrations capture the energy and enthusiasm of Belpré and her love of stories. The story is the perfect length to read to children during story hour. Planting Stories shows how one person can make a difference in the lives of children for many generations. It is a recommended purchase for public libraries and elementary school library collections, and it would make a great gift for the book lover in your life. So excited to read this one!! I love Anika's work and Paola's is just stunning!! I'm sure it will win awards next year!